I'm certified! (No, I didn't say certifiable.) 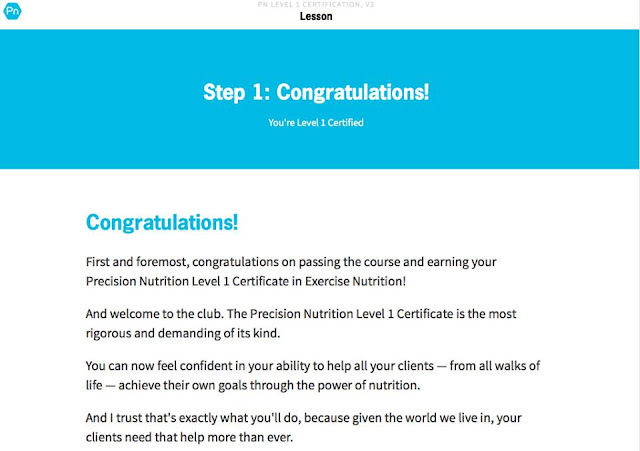 I just completed the Precision Nutrition level 1 sports and exercise nutrition course. I purchased the materials last October and studied regularly until Thanksgiving. The week of Thanksgiving I decided I needed a break from it (you know, after a month of studying. lol) and took a week off. Except I didn't pick that text book back up until March. I just couldn't find the time or energy to devote to it. I have a full-time job, two blogs, wifely duties and a spotless house (just kidding about that last one). These things happen. 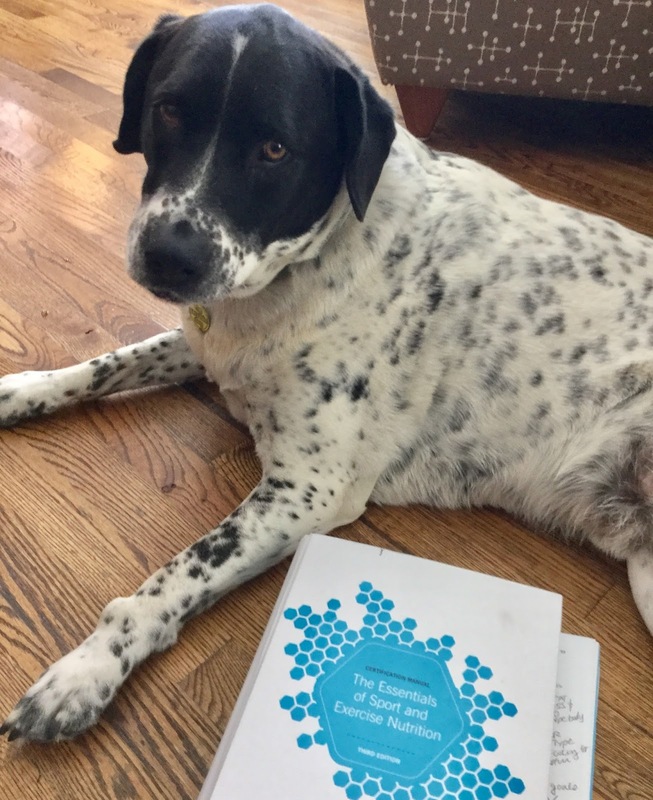 It was important to me and I knew I needed to find the motivation and accountability so I signed up for a study accountability partner online. My accountability buddy was one chapter ahead of me in the text, so we had a call to talk about our goals and I agreed to complete two chapters in one week (instead of my normal one a week) in order to catch up with her. I completed those two chapters in that first week back. It was all the momentum I needed to propel me through the course. Six weeks later I passed the certification test. As soon as I got my NASM personal trainer certification I realized that training wasn't enough to make an big impact in people's lives. Exercise is important and we all need it, but to make real lasting change we must get our nutrition and lifestyle habits on track. I knew what worked for me nutritionally, but I wanted a deeper understanding of nutrition science so I could help other people. I was drawn to Precision Nutrition because half the course is nutrition science and the other half is coaching. Other courses teach the science but not the skills to apply it in the real world. It's a major piece of the puzzle that many certifications miss. WHAT'S THE DIFFERENCE BETWEEN NUTRITION COACH, NUTRITIONIST AND REGISTERED DIETITIAN? Big difference. Different states have different laws but in Texas there is no licensing requirement to give general nutrition advice. That means anyone can call themselves a nutrition coach or nutritionist without a license, training or certification. I took this course so that I can help my clients with nutrition advice that is based in science. 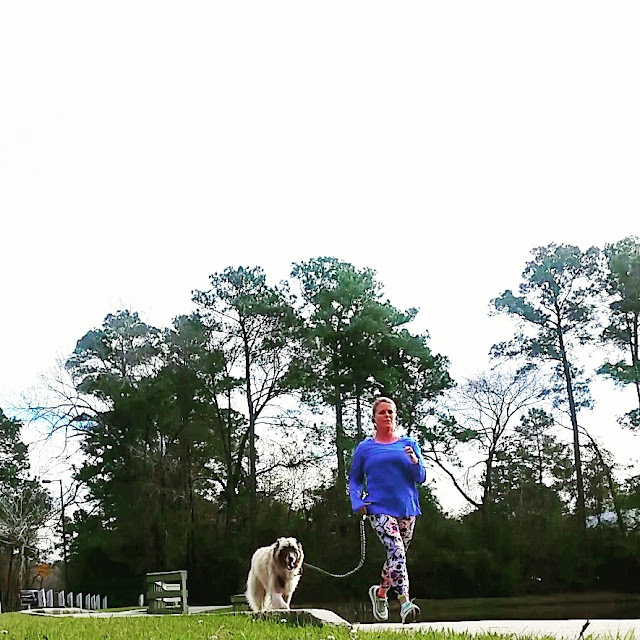 Any trainer can give advice based on their own experiences, but I wanted to provide my clients with broader more educated advice, so that I could be more effective and get results for my clients. I am not a Registered Dietitian. I am not licensed or qualified to prescribe a diet to diagnose, treat or cure any disease or eating disorder in a clinical setting. Most of my clients don't need that. If they do, I will refer out to a RD. Guide clients to choose nutrient-rich foods in proper portions for their individual goals, lifestyle and preferences. Educate clients about the benefits of each of the macronutrients; protein, fats and carbohydrates. Help clients wade through the vast amount of nutrition information to determine the best strategy to meet their individual goals. Help clients choose the supplements that might enhance their healthy lifestyle. Educate clients on nutrition and help them with strategies to improve their eating habits, body composition and exercise performance. Help clients understand the role of nutrition as it relates to exercise performance and recovery. Help clients manage their weight and meet their body composition goals through nutrition and exercise. Present nutritional science in an easy to understand way. I won't be giving out meal plans, I will be helping clients learn how to prepare their own meal plans based on their goals, lifestyle and preferences. THERE IS NO ONE "BEST DIET." Maybe I dived in hoping I was going to learn the secret formula for the perfect body. 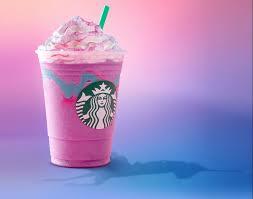 What was confirmed (that I already knew) is that there is no secret, no best diet, no magic formula. We are all so different and the best coaches have an open mind regarding different diet strategies. There is not one best diet for every person, no magic macronutrient split. Nutrition coaching is about working with each individual client to determine the strategy that works best for them based on their goals, lifestyle and activity levels. Determining the best diet for each individual requires experimenting, tracking and outcome-based decision making. It is a process that the client and coach collaborate on together. The Coach provides the guidance, structure, support, accountability and the client provides the feedback to determine the best practice. The course provides options for different strategies for different goals as well as ways to overcome obstacles and challenges. FOOD IS FUEL, BUT IT IS SO MUCH MORE. You hear fitness experts say it all the time, food is fuel. Yes, it's true that we need good nutrition to fuel our healthy lifestyles, but food is so much more than fuel. Let's not forget about food as way to connect with people, food for enjoyment and food to celebrate our cultures. To look at it in such a cold and detached way takes the fun and enjoyment out of food. We have to give ourselves permission to enjoy food as part of our healthy lifestyle. The Precision Nutrition coaching methodology is habit-based nutrition. Have you ever tried to change all your bad habits on one day, like on New Year's day? How did that work out for you? It usually doesn't. I'm as guilty as any. When we break down our goals into small sustainable habits executed over time we can make lifestyle changes that produce major results that last a lifetime. You know you need to make changes but it feels overwhelming and you don't know where to start. 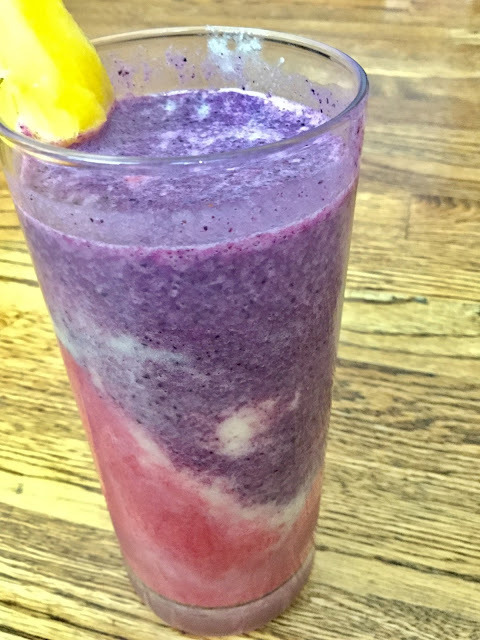 You are confused by all the conflicting health information on the internet. You're not sure of the correct path to follow. You already know what you "should" be doing but you are having trouble staying consistent. You tend to have an all-or-nothing mindset. You're either on your diet or off. You tried on your own (maybe many times) and had initial success but either stalled in your progress or gained the weight back. You're ready to get results once and for all. You would like professional guidance with your weight loss and health goals. You are committed to making a lasting change. 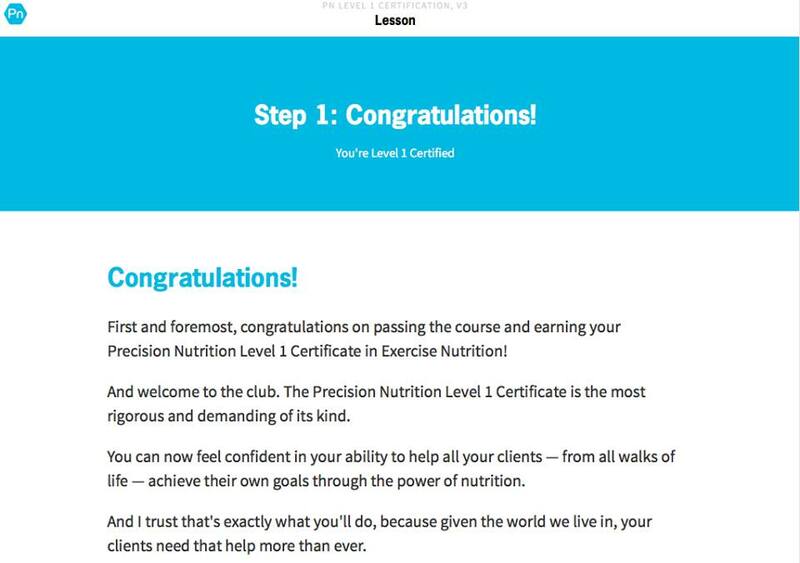 I loved the Precision Nutrition course and I highly recommend it. I laughed out loud several times in the text. Who doesn't love a science text that references A Confederacy of Dunces? While there were many times that the content was dense and abstract, the material was presented in such a way that even my marketing brain was able to absorb and understand. I kind of wish I would have taken this course before my personal trainer certification. A lot of the information was the same (energy systems, etc.) but presented in much easier to digest (pun intended) and entertaining way. Have you ever worked with a nutrition coach? 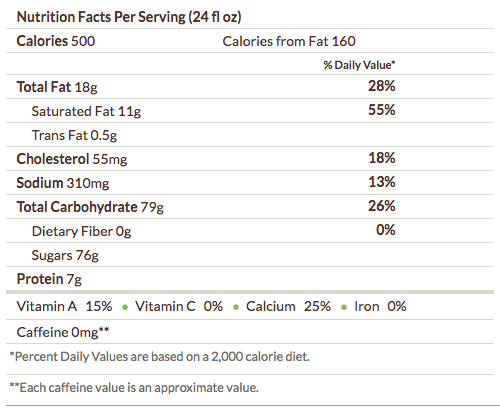 Have you heard of Precision Nutrition? Are you interested in coaching? This event was sponsored by Premier Protein. 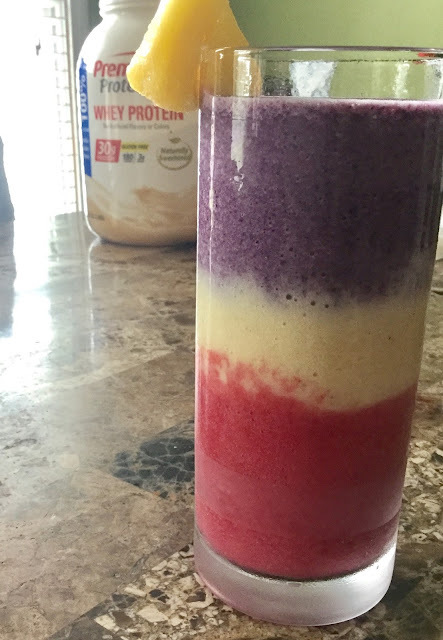 I am a Premier Protein ambassador. All opinions are my own. A couple of weeks ago I partnered with the local running store, Fort Worth Running Company and Premier Protein to provide tasty protein drinks and bars to the runners of Fort Worth after their Monday night social run. I am a Premier Protein ambassador and these types of events give me the opportunity to get out in the community and connect with my fellow fitness enthusiasts. I had so much fun at Fort Worth Running Company and it reminded me why running with a group can be so great. I am usually a solo runner and I tend to forget what I am missing out on when I run alone. When you sign up to run with a regular group you have people counting on you to show up. If you miss a workout, someone will probably notice. Besides, ever get home from work on Monday night and not feel like running? Yeah, me too. Having a fun group of people waiting on you sometimes is all the motivation you need to get out the door. A running group is a fantastic way to make like-minded friends in your community. Even if your immediate friends and family don't run, you can instantly connect with people who are as crazy dedicated as you. 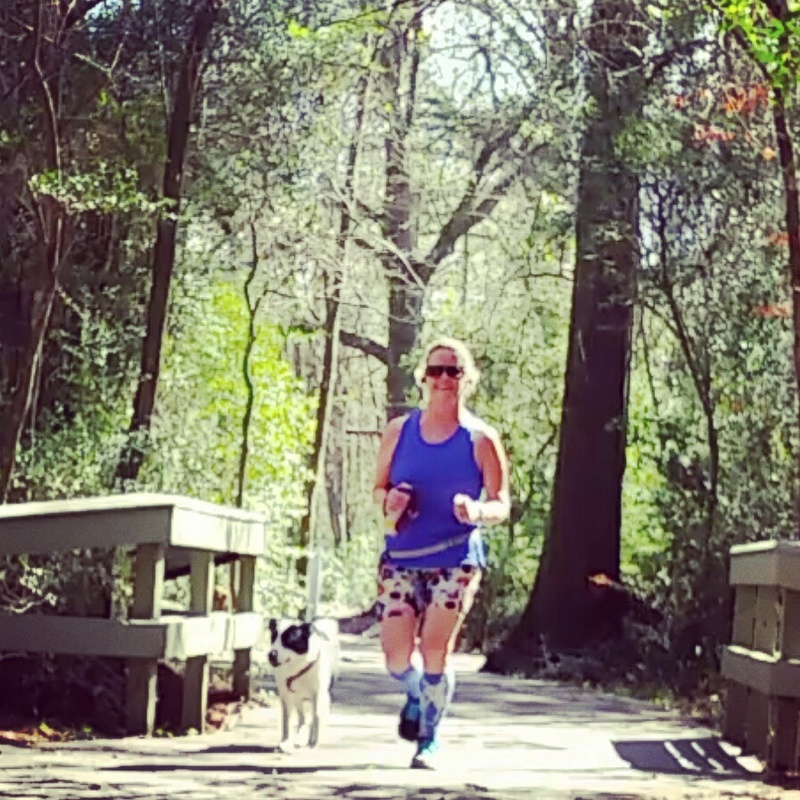 The running community is one of the most supportive communities I've ever seen. It doesn't matter if you run fast or slow, long or short distances, if you run 10 miles a week or 50 miles a week; runners all come together to support and cheer each other on. You never have to worry if you can keep up or if you'll fit in. 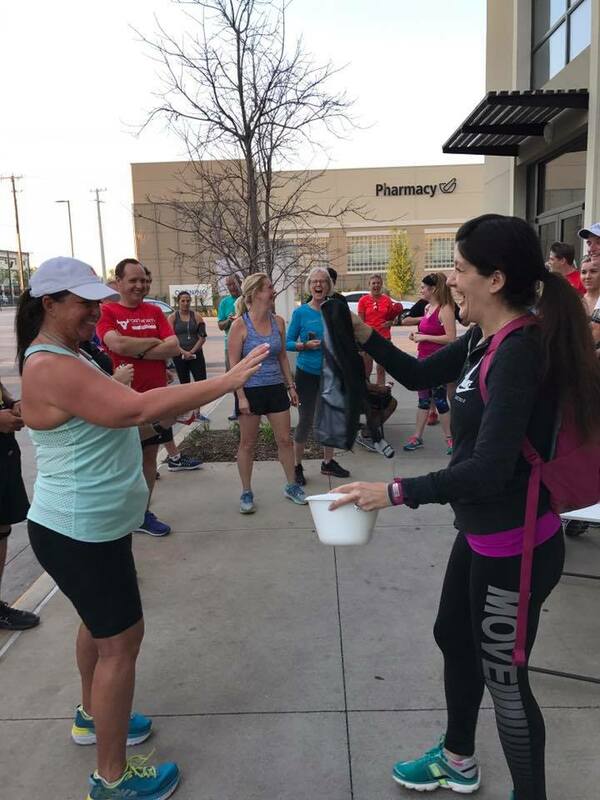 When you're surrounded by runners you're sure to connect with someone at your fitness level or someone who will help you elevate to the next level. Speaking of next level: Want to run faster? Then you need to run faster. Running with group can be a great way to join up with slightly faster runners to challenge yourself a bit. If you always run alone, you may be tempted to always run at your comfortable pace. Since groups have runners of all paces and abilities you can run part of your run with the fast guys and then slow down as needed, there will always be someone around. Combine faster runners with some friendly competition and this can be the catalyst for growth. Don't forget! This running thing is supposed to be fun. 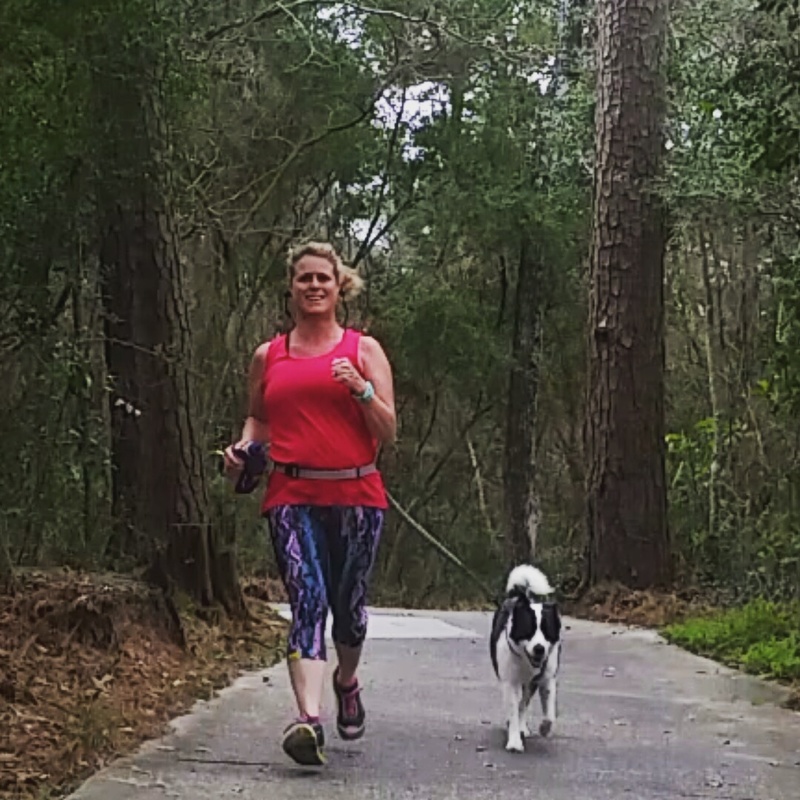 If you ever start to lose the joy in running, a group can be just what you need to bounce back. At Fort Worth Running Company everyone was laughing, joking and having a great time. 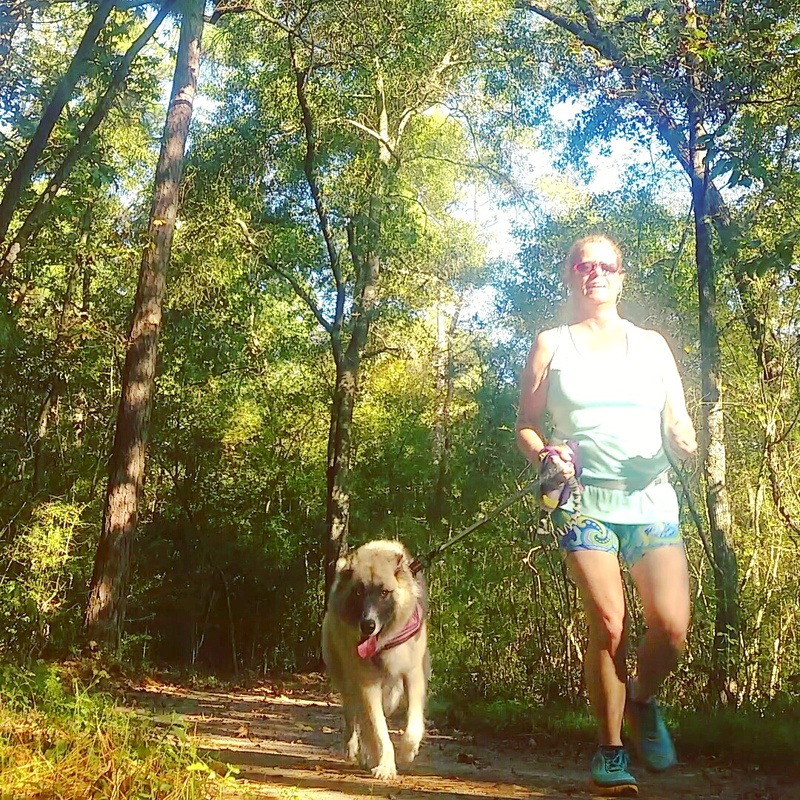 Running with a group can feel more like social hour than work out hour. Join a social running group to make new friends and catch up with old ones. After the run, the runners enjoyed Premier protein shakes and bars. Premier Protein generously provided prizes for a raffle giveaway after the run. 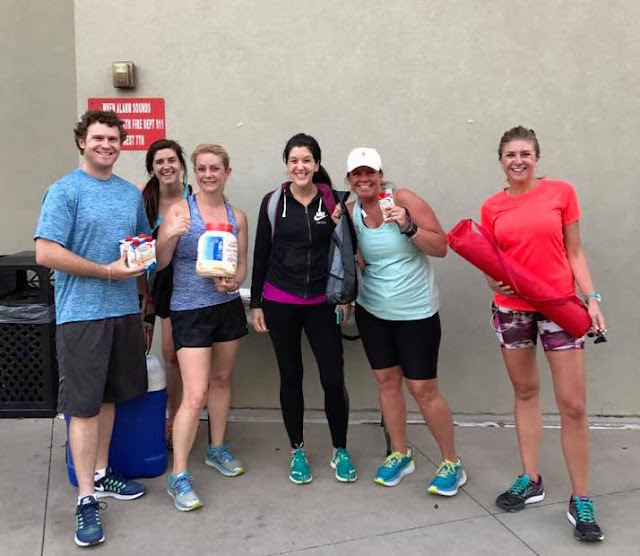 Some runners went home with gift bags, a tub of Protein powder, a yoga mat and a 4-pack of shakes. 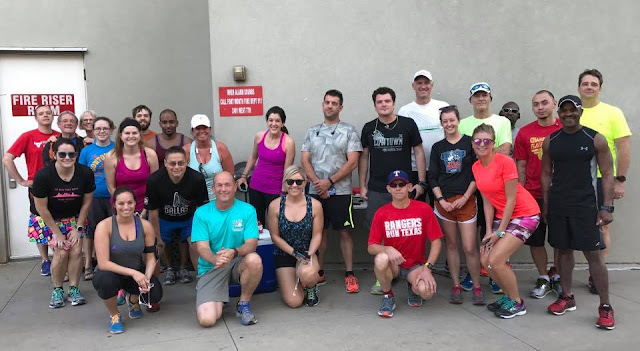 If you live in Fort Worth, I encourage you to sign up to run with Fort Worth Running Company's free Monday night social run. If you are not in Fort Worth, seek out your local running store or group for social runs. Find your people. Premier Protein's 2017 messaging is The Day is Yours (#thedayisyours). Make the most of each day. I can't imagine a better way of making the most of a Monday night than meeting up with some local friends for a run. Thank you so much to Fort Worth Running Company for having me and to Premier Protein for the fuel! Everyone had a great time. If you want to sign up for the next social run at Fort Worth Running Company follow their Facebook page. Do you run with a group? Hey, did I mention I was interviewed on Accuro as part of their Expert Interview Series? Check it out here!